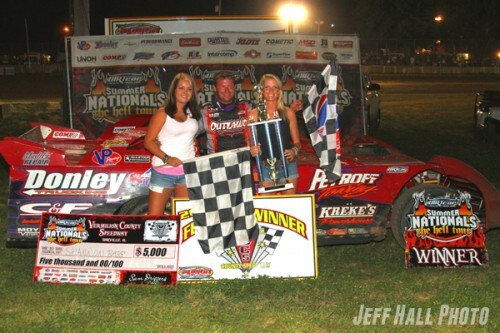 DANVILLE, Ill. — July 14, 2013 — Shannon Babb scored his sixth victory of the 2013 DIRTcar Summer Nationals “Hell Tour” on Sunday night in a thriller at Vermilion County Speedway to tie Billy Moyer’s record of 82 all-time wins. Babb, of Moweaqua, Ill., might be a long shot to capture his fourth Summer Nationals title as the series is in its final week, but that won’t keep him from fighting for victories. Babb captured the pole-position over Frank Heckenast Jr., who pulled out to the early lead. The outside groove was the fast groove early on as the outside starting Heckenast shot around Babb, pulling fourth-place-starting Mike Spatola with him. 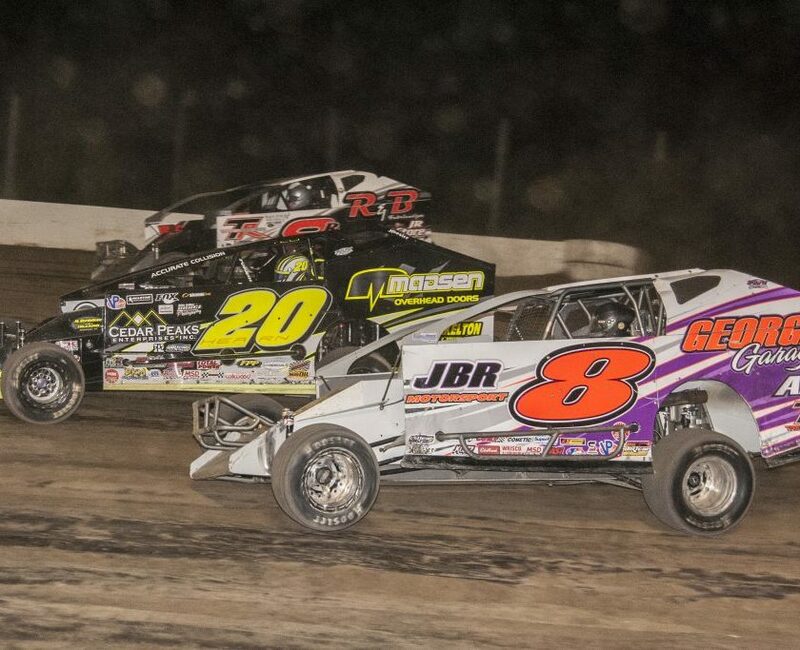 Babb was finally able to move his car to the faster groove and gain back ground on the leaders as red-hot Bobby Pierce joined the four-way battle for the lead. Babb muscled his way around second-place running Spatola on lap 11, setting his sights on leader Heckenast as the leaders approached lapped traffic. On lap 19 two cars racing side-by-side trying to stay on the lead lap slowed down the leaders enough to bunch the top four in the outside lane. Babb captured the lead on lap 22 and led for six laps before Spatola and Pierce went by. Babb recaptured the lead for good on lap 31. Babb and Pierce then distanced themselves from Spatola and Heckenast. Pierce gave Babb a run for his money, challenging him on the inside line, but came up just short as Babb claimed the $5,000 checkered flag and the 82nd victory of his DIRTcar Summer Nationals career. Mike Spatola, Brandon Sheppard and Frank Heckenast Jr. rounded out the top five. Heat race winners included Shannon Babb, Frank Heckast Jr. and Brandon Sheppard. 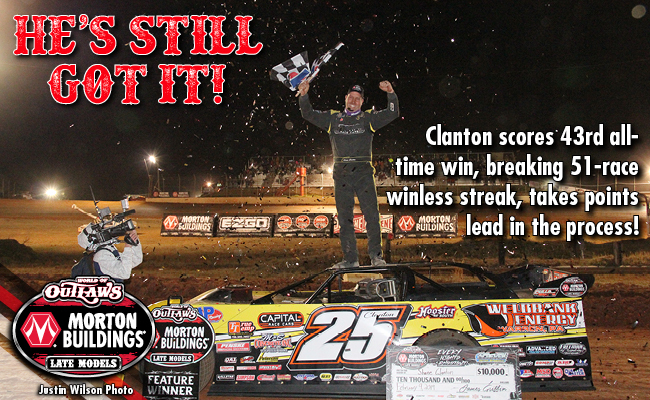 The DIRTcar Summer Nationals Hell Tour continues in its final week of action on Monday night at Peoria Speedway located in Peoria, Ill. Shannon Babb will be attempting to break the all-time win record at Peoria, where last won on the Summer Nationals “Hell Tour” in 2011. 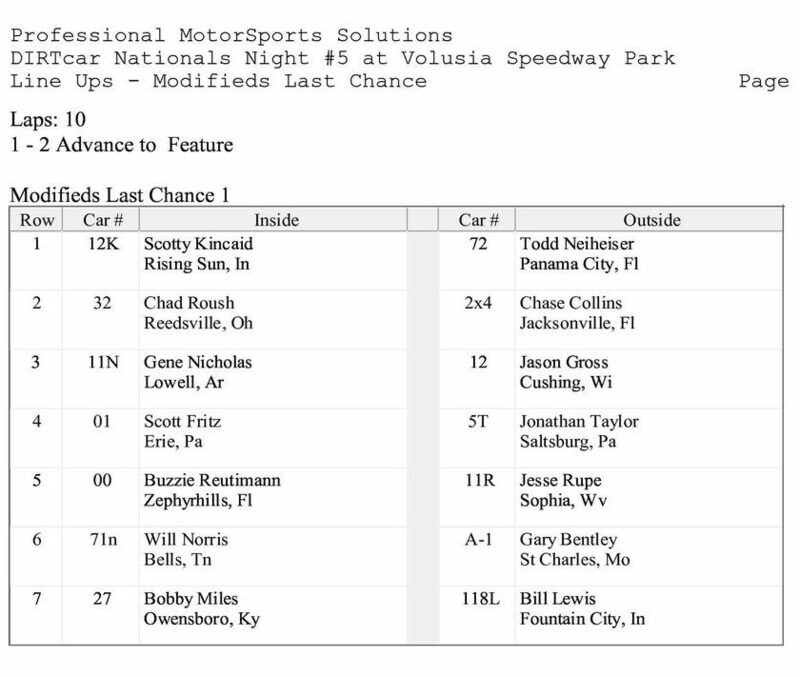 A-Main (40-laps): 1. Shannon Babb ($5,000), 2. Bobby Pierce, 3. Mike Spatola, 4. Brandon Sheppard, 5. Frank Heckenast Jr, 6. Brian Shirley, 7. Kent Robinson, 8. Kevin Weaver, 9. Jason Jaggers, 10. Tanner English, 11. Dustin Griffin, 12. Scott Schmitt, 13. Brian Divley, 14. Scott Bull, 15. Jason McBride, 16. Tim Lance, 17. Steve Thorsten, 18. Todd Frank, 19. Aaron Ricketts, 20. Kyle Madison, 21. MCKay Wenger, 22. Randy Korte.